To Tate Modern this evening. Absolutely rammed with people drinking. Didn't feel right at all. So is it a pub now? On to the Red Star Over Russia show. No art to be found there, either. Plenty of propaganda posters. Felt distinctly uncomfortable. Someone has been hoarding all this. 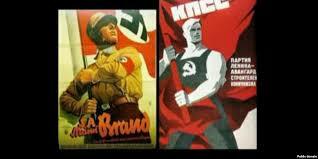 I daresay a show of Nazi propaganda prints is not far off: it is really not very different. Grim. And if you are going to show this stuff, find a museum that does history. Insofar as there is 'art', it is mostly of that communist kitsch kind with which owners like to deck out second rate restaurants. ...and another thing. The little brochure you are given as you go in to the exhibition tells us that "The German invasion of 1941 drew the USSR into the Second World War''. I'm sorry - what? On 17 September, 1939 the USSR invaded Poland. On 30 November the communists started trying to invade Finland. This was followed by Soviet annexations of Estonia, Latvia, Lithuania, and parts of Romania. Pretty warlike if you ask me. All part of a pact the USSR had with Nazi Germany. The Tate giving us alternative facts.